My oldest had a birthday yesterday. And not just any birthday. He has entered DOUBLE DIGITS. His feet are now bigger than mine. What happened?! So he has totally outgrown his little dresser (which you can see HERE - it had awesome belt strap drawer pulls! ), and I got this one from a friend's garage sale. It was the perfect size and all! 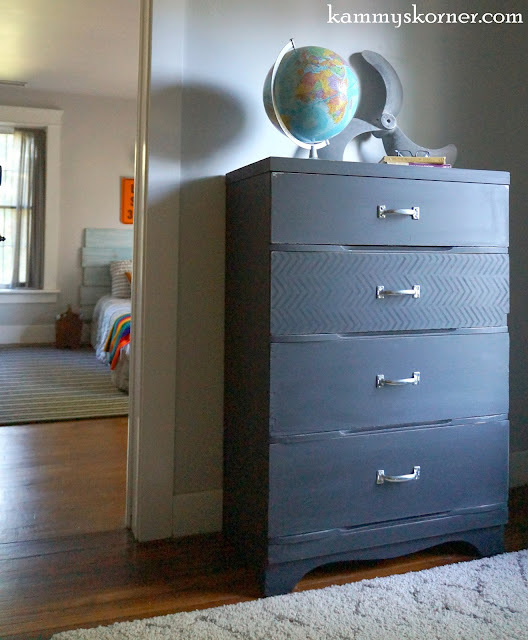 And then I gave the whole thing two coats of home made black chalk paint. I do not measure, but put probably about 1/4 cup hot water into a cool whip dish and added a few tablespoons of Plaster of Paris. When that was stirred and dissolved, I poured in some black paint and stirred it well. Done! Then after toying with several different ideas that just didn't seem right.... I landed upon my little chevron stencil. 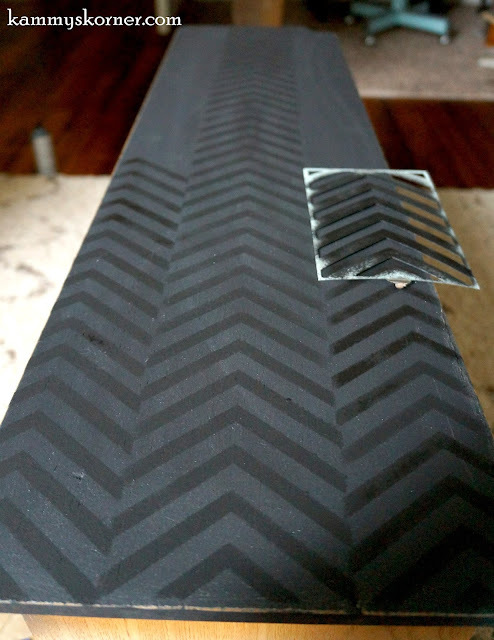 Now I KNOW chevron is quickly going the way of big hair and white nylons, but with the narrow stripes of this stencil and by off centering the stripes a bit, it gives it more of a herringbone look. 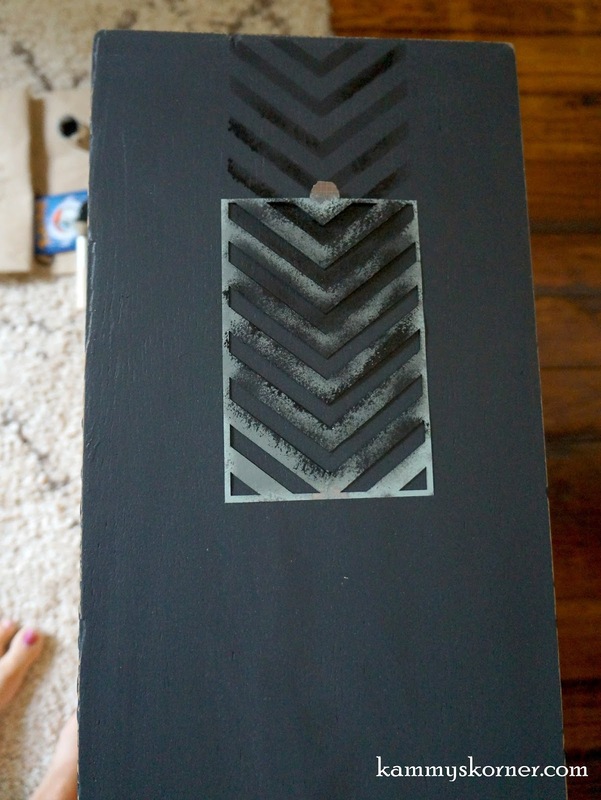 I used black acrylic crafter's paint that you can buy for a dollar a bottle about anywhere and got to work. Oh my, tedious is not my middle name. 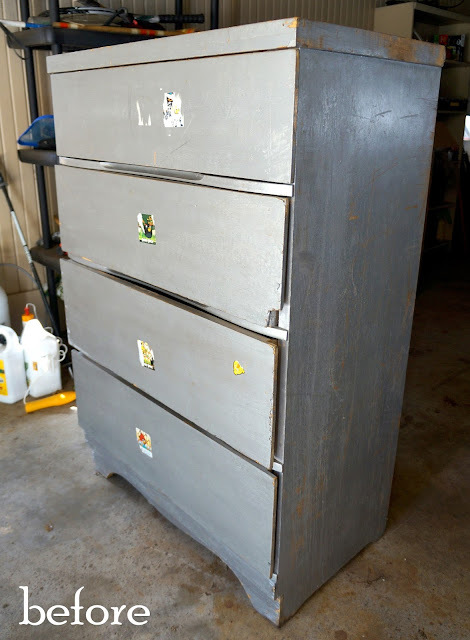 I'm glad I wanted an accent drawer and didn't do all four of them - I would have lost my ever loving mind. The black on black is just enough contrast and doesn't scream "I'M CHEVRON and I'm still trying to be the cool kid!!!!" Instead it confidently states "I'm the man. I'm masculine, and tough, and roll with it while keepin' it classy." Yeah. 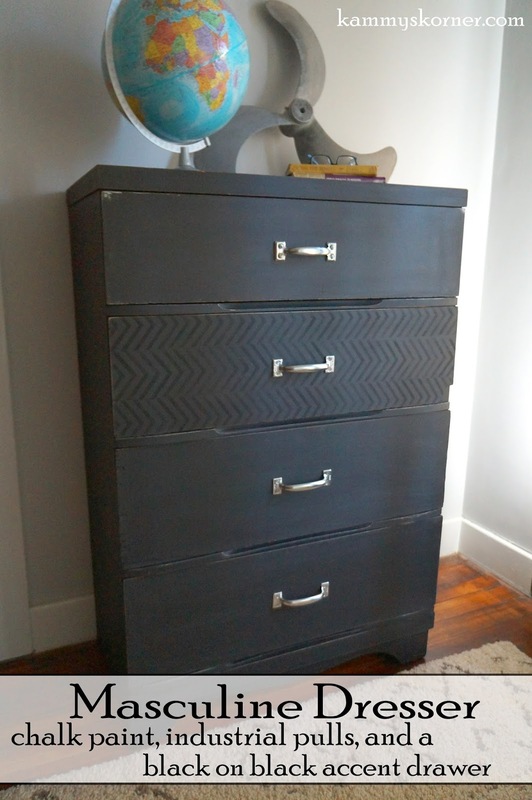 While this dresser doesn't need drawer pulls out of necessity.... it still needed something for style! I found this handle in the garage in a bucket of odds and ends. I have no idea where it came from but I'm sure I saved it off of something because ya know, might be able to use that some day! I took it to Menards last night and found three more almost exact matches. They were only $2 each! You will not find these in the drawer pulls and knobs section, however! But now my mind is foggy on what isle they were in. Sorry! It's really cool! 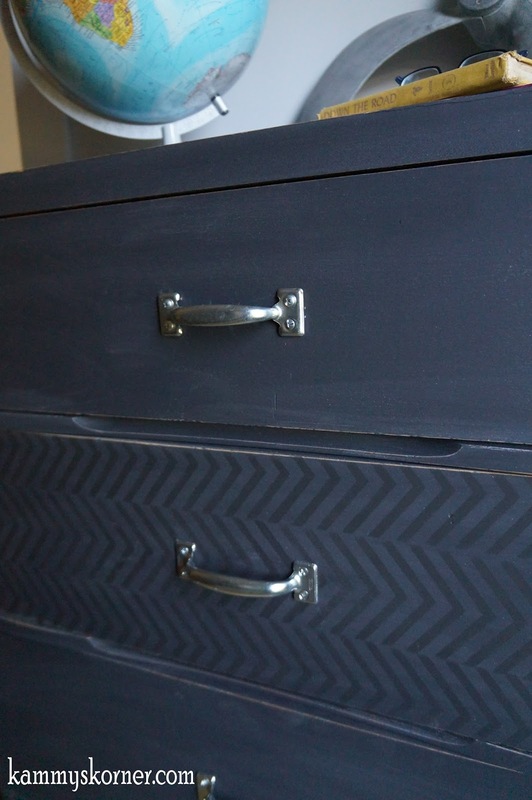 The stencil job makes it look like a tire track on the drawer. Love it! 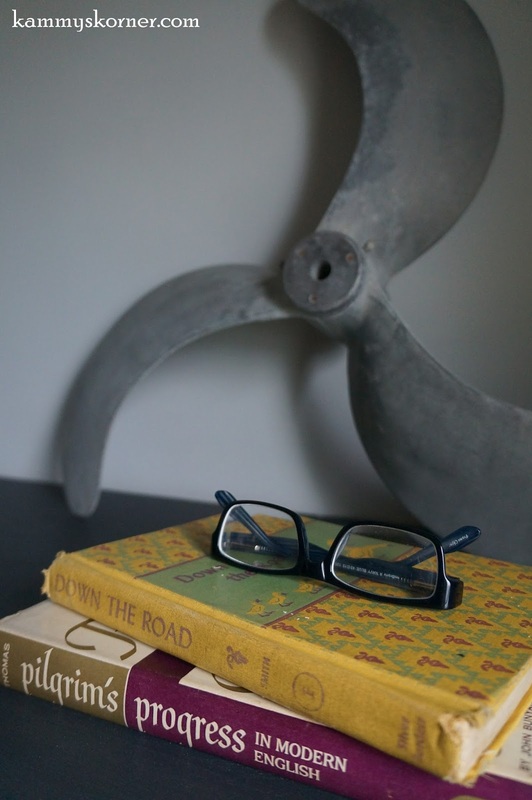 And I agree with the above comment, the pattern can totally pass for tire treads, a totally boyish/manish pattern.